We just started working with a homebuyer who wants to buy a home in Tallahassee for less than $300,000, and our review of the options and opportunities for this buyer provided some great content for a real estate blog. So, if you've ever wondered where to go to buy a $300,000 home in Tallahassee, here's your answer. First of all, you could start by searching the Tallahassee MLS to see how many homes are listed in this price range. Currently, there are 180 homes for sale in Tallahassee between $250K and $300K, which represents about 1 year's supply of inventory. This means that if nobody puts another home on the market in this price range for the next year, and nobody lowers their asking price to this price range in the next year, then we already have enough inventory to satisfy the current rate of demand for a $300,000 home in Tallahassee for another year. Simply put, that is way too much inventory and thus homebuyers have a great opportunity to find a super deal. Where Has a $300,000 Home In Tallahassee Been Purchased? The next step in our process is to determine where recent purchases in the $250,000 to $300,000 home in Tallahassee have occurred. If you are going to buy a home in this price range, you want to make sure that you not only explore all opportunities, you also want to ensure that you safely invest your money by purchasing a home in a neighborhood that consistently supports your price point. 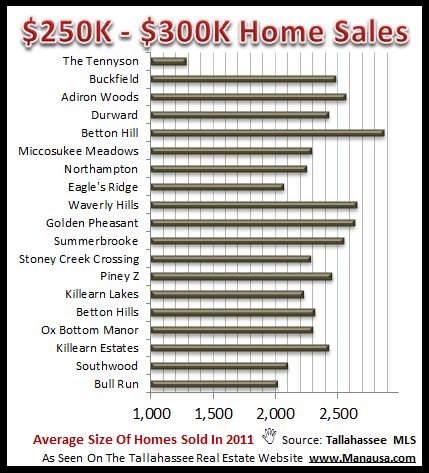 You wouldn't want to buy a $300,000 home in Tallahassee in a neighborhood where mostly $150,000 homes are selling. Thus far in 2011, Bull Run and Southwood have the most home sales in the $250,000 to $300,000 price range, but Ox Bottom Manor and Killearn Estates have quite a few as well. Now that we have a good understanding of where people have gone to buy a $300,000 home in Tallahassee, we next want to get a feel for value (what do they get for their money?). 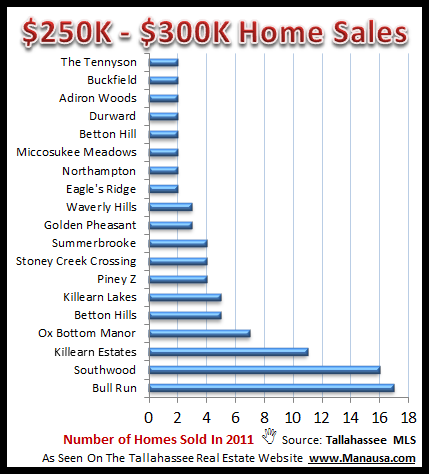 If we look at the price per square foot of $300,000 homes in Tallahassee, one neighborhood stands out as the best bang for the buck. Betton Hill gives you the most house for the dollar, though the age of the homes are older than the other neighborhoods. Regardless of the price range that you need to purchase, buying a home in Tallahassee should be a fun, exciting and rewarding process. Behind the scenes, we will ensure that you are kept safe in your real estate investment by ensuring that you have the full information about the real estate market for your price range. If you are thinking about buying a home, just drop me a note and we will schedule an initial interview to get you started on your way to owning a home in Tallahassee!